Identify your addressable market: Investors want to know that you have identified your addressable subset of the market. When you start an organic soda company, for example, your addressable piece of the market is not the $100+ billion world soft drink market, but more like the $21 million bottled, carbonated, organic U.S. soft drink market. 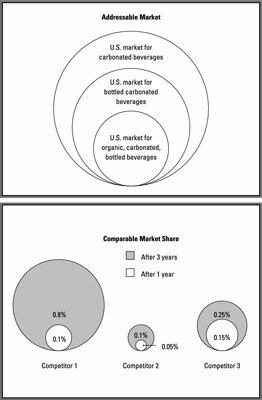 The top slide in the figure shows the addressable market for a company focused on organic carbonated beverages that are sold in bottles but not as fountain drinks. Make each circle relative to the size of the market and add market values. Traction in the market: To show traction as related to addressable market, you can discuss the piece of the market that you have touched to date. In the organic soda company example, your company’s share of the market may only be the Whole Foods-shelved subset of the bottled, carbonated, organic soft drink market. How long have you been available in that market, what percentage share of that market have you captured, and how does that fare for current sales? If your company is pre-revenue you cannot pretend to know what your market share will be in the future. Instead, show the market share growth for your competitors, as the bottom slide in the figure does. Investors will average the success of your competitors and assume your market share growth will fall somewhere in the middle. Pre-revenue market capture: If you have not yet sold your product, discuss which piece of the market you plan to touch first. How will you go about it? You can build a mailing list of future customers who are interested to hear about your progress in developing your product. Some companies hold events or promote other products to get consumers interested in their products before they’re even available.